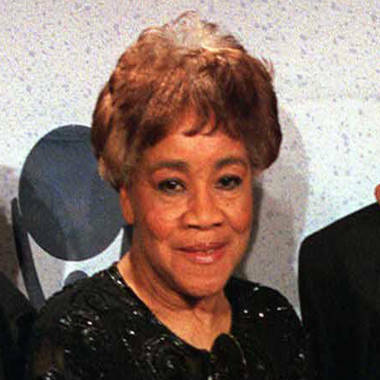 Cleotha Staples of The Staples Singers, pictured at the Rock and Roll Hall of Fame induction ceremony in 1999. The group sang songs such as "Respect Yourself. Cleotha died Feb. 19, 2012. Cleotha Staples, a founding member of the beloved Chicago soul group the Staple Singers, died Wednesday after a long battle with Alzheimer's, her sister Mavis Staples' rep has confirmed to Rolling Stone. She was 78. Staples had suffered from the disease for 12 years, and recently had been under 24-hour home care. Mavis Staples told the Chicago Tribune that Cleotha's longtime caretaker was with her when she died Wednesday morning in her high-rise condominium on the South Side of Chicago. Belting the distinctive soprano parts on the Staple Singers soaring harmonies, Cleotha was a crucial part of the group's success on hits such as "I'll Take You There," "Respect Yourself" and "Uncloudy Day." Cleotha, the oldest child of Roebuck "Pops" and Osceola Staples, began learning to sing in the late Forties when Pops taught her and her siblings – Mavis, Pervis and Yvonne – the songs he had sung as a child with his family at Dockery Farm plantation in Mississippi. Soon the Staple Singers were performing at churches throughout the South Side, and by 1953 they were cutting records and playing shows outside of Chicago. The group scored their first nationwide gospel hit, "Uncloudy Day," in 1957, and saw continued success during the late Sixties and early Seventies with tracks produced by Stax Records' Al Bell. "I credit Pops' guitar and Cleedy’s voice with making our sound so different," Mavis Staples said, referring to her sister by a nickname. "Her high voice – Pops would take her to a minor key a lot. A lot of singers would try to sing like her. Gladys Knight’s background singer [in the Pips], William [Guest], would tell Cleedy, 'I'm trying to sound like you.' Her voice would just ring in your ear. It wasn't harsh or hitting you hard, it was soothing. She gave us that country sound. The way we sang was the way Pops and his brothers and sisters would sing down in Mississippi. Those were the voices they would use to sing after dinner out on the gallery."